Even as the economy continues to sputter and businesses scratch and claw for revenue, boaters continue to use their boats. This has opened opportunities for a host of service-related businesses, from the repair and parts departments found in dealerships to small, specialized companies like the one run by Dave Merrill (BoatMoorings.com). Helix anchors are essentially 10- or 15-foot screws installed in the sea bed instead of the traditional mushroom anchors or large concrete blocks used for boat moorings. The helix can deliver three to four times the holding power of mushrooms or concrete, and the concept is considered friendlier to marine habitats because of its smaller footprint, according to Merrill. Three years ago Merrill introduced the Eco-Mooring rode, a 12-strand polyfiber rope that sheaths inner elastic cords. The rode floats, so it doesn’t scour the bottom the way a chain setup does, providing an additional environmental benefit. The rode, which can withstand more than 33,000 pounds of force, reduces shock loads by stretching from its relaxed length of 12 feet to 19 feet fully loaded. Other advantages are a longer life span than chain and the ability to use a shorter scope, so more moorings can be placed in tighter spaces. “It’s eco-friendly and definitely a good combination when used with helix anchors,” Merrill says. His two most recent jobs, this spring and summer, were installing 25 Eco-Moorings around Misery Island off Beverly, Mass., and 41 transient moorings in the harbor at New London, Conn. He’s working with Aruba’s government to survey sites in September for 150 moorings in a newly established marine park. 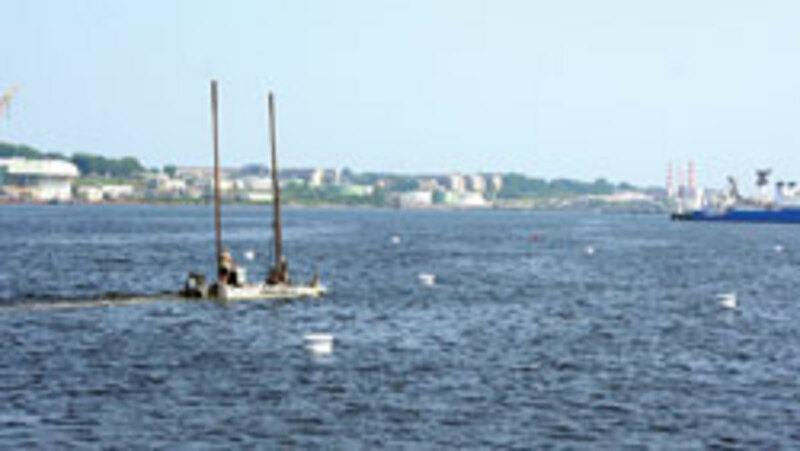 He also has his eye on a job to install a half-dozen moorings in Provincetown, Mass. — all of this at $500 to $1,000 per helix anchor (manufactured by A.B. Chance) and $300 to $350 for the Eco-Mooring rode, which comes in two widths. Merrill is part of a three-man team that has installed thousands of helix anchors around the world, from Fiji to the Seychelles — even Iceland. In addition to boat moorings, the anchors are used to hold docks, piers, breakwaters, bulkheads, pipelines, fish pens, navigation buoys and scientific equipment. “Keep the operation lean and as efficient as you can, then hopefully you can keep working,” Merrill says of surviving in the weak economy. When traditional mooring systems were found to be destroying eelgrass off Nantucket, Mass., Merrill’s company was hired to install 24 helix anchors as part of a mitigation agreement with shellfishermen. Eelgrass, critical to marine life, was replanted and is making a comeback. Elsewhere, the state of Florida is recommending the use of helix anchors for all of its upcoming mooring field projects. Merrill, who recently installed anchors in Miami Harbor, is hoping to be involved with those. A 24-foot barge, powered by a 60-hp 4-stroke Yamaha with a hydraulic torque motor for screwing the anchors in, is his primary work platform. 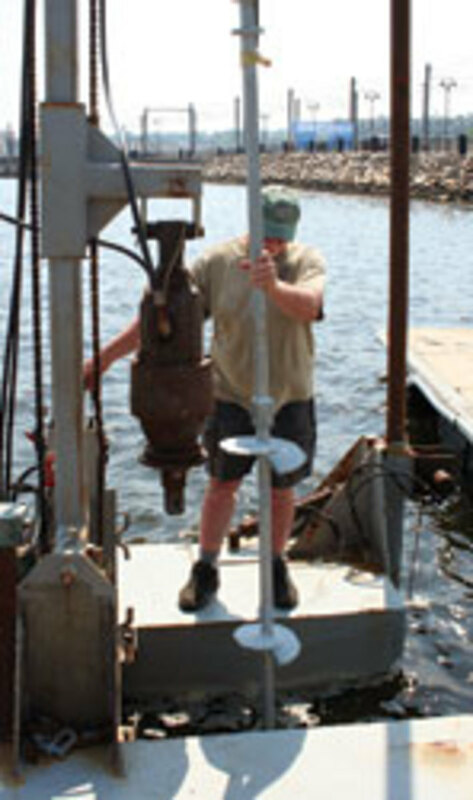 Boat Moorings.com is one of three major players that offer elastic mooring devices. The others are Seaflex (www.seaflex.net) and Hazelett Marine (www.hazelettmarine.com).